Two sebaceous cysts excised from Itsy, with congealed sebum allowed to flow out. Recently we removed two sebaceous cysts from Itsy, a West Highland White Terrier. Larger cyst, subcutaneous fat dissected away to reveal incised wall of cyst. 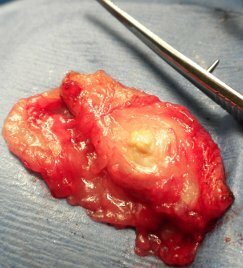 I thought our stronger-stomached readers would like to see what a sebaceous cyst looks like from the underside. In the photos below I have dissected away the subcutaneous (under the skin) fat and incised the cyst itself to allow the release of the congealed sebum contained therein. Itsy was anesthetized for removal of a growth on her head that looked “angry,” so we decided to remove these two sebaceous cysts, too. Of course, normal dog and cat skin oil doesn’t look like this. Rather, it is about the consistency of cooking oil and spreads over the skin and hair as a protective, lubricating, sealing material.